Under Armour has slowly built its reputation to be one of the most sought after brands for athletic clothing and footwear. In fact the company is so confident of their products that they offer a full refund for any product if a customer is not satisfied with it. Under Armour has gained its reputation for being innovative. Among all types of gear, footwear is one area that Under Armour has incorporated numerous technologies to boost performance and comfort which has been well received by customers based on the numerous reviews in multiple websites online. One technology introduced to certain Under Armour shoes is known as Cartilage ™. Cartilage adds elasticity to the shoe giving the shoe a more natural feel resulting in more comfort and in turn better performance. There are numerous types of Under Armour cartilage shoes however they cannot be individually searched for as Cartilage is just a single component of the various Under Armour shoes that incorporate this technology. For this reason, we have outlined some of the best Under Armour cartilage shoes to choose from. 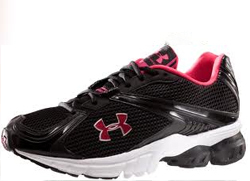 Women’s Janan Running Shoe – This is an excellent pair of under armour cartilage shoes for women. Besides the cartilage technology, it comprises of an array of other features making it the perfect pair of shoes for the woman who likes to take a brisk run in different terrain. It’s made up of tough nylon to maximize durability whilst providing comfort and encouraging airflow. Apart from durability, the nylon prevents any particles such as sand or small stones from entering the shoe as well. It uses a revolutionary technology known as DCE which is a combination of numerous Under Armour technologies that retains energy upon impact and releases it, easing the process of running. Additionally, it has a Footsleeve that acts as a “seatbelt” for your feet and prevents sliding which can cause discomfort. The Janan Running shoe has a pink blend and while the color may be a cliché for a pair of women’s shoes, it complements the design quite well. Men’s Fleet II Running Shoe – The Fleet II running shoe consists of cushioning that not only provides comfort but protects the feet when running continuously on rough terrain preventing any soreness or fatigue in the feet after prolonged periods. It also has directional cushioning which is another common technology used by Under Armour for added stability. Another technology used in the Fleet II apart from Cartilage is ArmourLastic which acts as a shock absorber making a run on rough terrain to be less strenuous on the feet. The Fleet II shoe is available in white or black and has the signature, bulky appearance of a pair of running shoes. As aforementioned, Under Armour footwear has not been categorized based on the features included, which will make looking for cartilage shoes on their website quite a challenge. If you visit one of their stores however, the sales personnel will assuredly direct you to the numerous models that have the Cartilage technology. Online, you may find some of the shoes with Cartilage by searching their website.